I've been considering a gearing dilemma lately. The 4-piece Holy Tier 7 set bonus (-5% to the cost of Holy Light) is really, really good. Insanely good, in fact. However, you can't just wear Tier 7 forever. At what point should you break the set? Should you break it when you get your first upgrade, or should you wait to upgrade a couple pieces simultaneously? Maybe I should upgrade at the first opportunity, but keep the T7 in my bags, and swap back if I am having mana issues. The rule of thumb there is usually don't break a tier bonus unless it's for another tier bonus. A single piece is probably never worth breaking a set bonus. I just had this problem. I had 4pc T7 with the Sarth chest. And then the Ancient Iron Heaume dropped off the Iron Council. It was an upgrade over the T7 helm. Well, I bid on it and was the only holy pally in the run, so I got it, and I resigned myself to stashing it in the bank for a while, because I didn't have the Valorous chest. For a very small price in spellpower and crit, I gained 40 haste and 165 mana and managed to keep my 4pc set bonus. Our 2pc T8 bonus is: Your Holy Shock critical heals now also place a periodic healing effect on the target, healing for 15% of the Holy Shock's heal amount over 9 sec. I'm thinking most of my gear upgrades will be in non-tier-set slots, unless the piece of tier doesn't have a stupid amount of MP5 on it. Which is basically the helm and the shoulders. Break 4pc T75 when you have three pieces of T8 or offset. Having three pieces will more than make up for the T7 4pc. in terms of mana and +Haste. Also, if you guild is progressing through Ulduar, you'll find yourself tech-healing (using HS/FoL combos) much, much more frequently now. Most encounters aren't healing intensive as they are about raid positioning, DPS-racing, and tanking assignments. You'll rarely end up spamming HL more than 7-8 times in a row before you have to move or everyone is fine. So keep T7 4pc. until you have three pieces of T8 (or offset). The stats will more than balance out. I got the sholders from razorscale, and they are more haste that valor, I still had the old Valor chest, so I can get the 4pc bonus for now, rather than the Chest of great aspects. Like most I am going to get the new pieces and weigh my options... If it isnt an upgrade to break the set bonus save it til you have another piece that will make it worth it. My .02. If you have T 7.5, Valorous, then don't break it for the current gear. Ulduar T 8.5 just isn't enough stats in those 4 pieces to be better than the awesome bonus for T 7. Hopefully the next raid set will be a less dumb bonus than Ulduar. Well, the other point is that the 4-pc T7 bonus is purely a longevity bonus. If I'm not using that extra mana (i.e. I'm ending fights with extra mana), I should convert the longevity into more power. Of course, more power is a bit redundant when you are primarily healing with Holy Light. 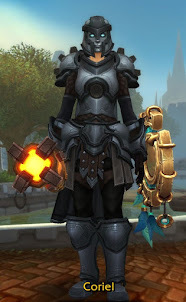 I'm not a fan of the new 4pc paladin set bonus,but the 2pc is quite impressive so far. It's a give or take,a push.To each his own. I broke my T7 set a while ago collecting BiS items in preparation for Ulduar. I'm using the Elevated Lair Pauldrons (maly 25), Chestplate of Great Aspects (OS25), and T7 legs/hands. I still have the holy shock bonus, but with a little extra mp5 and sp. In terms of mitigation for the tank, the 2pc T8 bonus is more than worth breaking your old set, I'd say. In my opinion 4-pc T7 bonus is useless. I prefer to equip 3 Valorous and offset items without MP5. With this gear I have absolutely no mana problems in Ulduar 25-man. I'll be breaking my 4xT7.5 set when I have at least 2, probably the 4 set of t8 or t8.5. Before then the bonus is just not worth it. That said, I think we can get good use of the T items before the boss encounters, by using them to create special-sets. ie. I don't need to be at the same hit cap on Trash as dps, or having an avoidance set for tanking as well as HP set. Those items, and even the old items we replaced with t7/7.5 can still be darn useful. IMO, Run without 4P T7.5 and I don't think you will see the difference if you are wearing BiS naxx/os/mal & Ulduar 25man gear.